The Chicago Breaking News Center is reporting that a 24-year old woman was killed when she was run over by a truck outside Hamlin Park in the Roscoe Village neighborhood on Chicago's North Side. According to the report, the woman was killed when she slipped off of her bike as she attempted to go between a CTA bus and a truck while travelling southbound on Damen Avenue. It is further reported that she was killed when the truck unintentionally drove over her. Damen is only one lane northbound and one lane southbound in this area of Roscoe Village. Hamlin Park is located between Barry (3100 N) and Wellington (3000 N). Damen (2000 W) serves as the park's eastern border. According to the City of Chicago's bike map, there is an existing bike lane that runs southbound on Damen Avenue until Belmont (3200 N), which is one block north of Barry (3100 N). An existing bike lane starts at Diversey (2800 N), which is two blocks south of Wellington (3000 N). According to the map, there appears to be a four block "gap" on Damen Avenue between Belmont (3200 N) and Diversey (2800 N) without a shared lane for bicycles or an existing bike path. However, as any bicyclist, motorist or police officer on the North Side will tell you, Damen Avenue at this juncture is highly used by bicyclists. Damen is the most direct route to Elston, which is one of the most used roadways in Chicago by bicyclists because of its clearly defined bike lane and its direct angle into the Loop. Given the presence of the shared lane to the north and the bike lane to the south on Damen Avenue, it is simply logical that this area of Damen Avenue is a de facto bike lane. 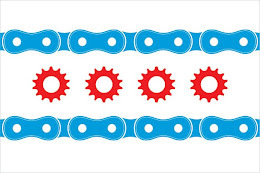 If you have any questions regarding this post, or would like to discuss any aspect of bicycle law, including your rights as an injured person, please call Mike Keating at 312-208-7702 or email MKeating@KeatingLegal.com. All initial consultations are done for free and with no obligation.